It's rare to find a company so confident in their product that they back it with a lifetime warranty, but that's exactly what Hitachi has done with their DS18DGL Cordless Compact Drill Driver Kit. The tool is backed by a lifetime warranty; the charger is backed by a 1 year warranty; and the battery is backed by a 2-year warranty. Hitachi has made this drill driver to the highest standards, and is willing to stand behind it for a lifetime. 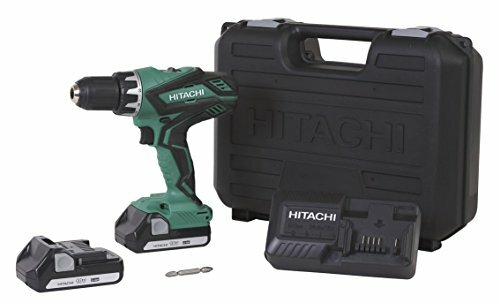 Who is the Hitachi DS18DGL Cordless Compact Drill Driver Kit for? What's included with the Hitachi DS18DGL Cordless Compact Drill Driver Kit? The Hitachi DS18DGL Cordless Compact Drill Driver Kit is designed to professional standards. It is compact and powerful, with 400 inches/pound of torque. It has two speed gears, and a 22+1 stage clutch, for the greatest power and precision. The 1/2” keyless ratcheting chuck makes bit replacements fast and simple. The built-in LED work light is placed to illuminate the work area and minimize shadows. It is extremely well balanced and ergonomically comfortable, for enduring comfort and reduced fatigue over long jobs. The included battery charger will charge batteries in 35 minutes or less, to minimize downtime, and the included backup battery can eliminate downtime altogether. Many cordless tools require you to purchase a second, backup battery, but Hitachi has included it in the DS18DGL. This is an excellent cordless drill for anyone, but it's especially good for those who specifically need hand tools that have slender handles, are lighter in weight, and are easier to control. The innovative design of the battery pack on the Hitachi DS18DGL Cordless Compact Drill Driver allows the grip to be smaller and more comfortable to hold for extended periods. It weighs 3.7 pounds, and can be held in one hand. It's a great tool for those who need comfort and control when using a tool, without sacrificing speed, power, or torque. The included backup battery is a huge advantage in this tool. Even with the lightning-fast charge time of the included charger at just 35 minutes, the ability to change batteries and keep working without buying a second battery is a fantastic feature of the Hitachi DS18DGL. It makes the best use of your time, no matter what kind of project you are working on. The Hitachi DS18DGL Cordless Compact Drill Driver Kit is a tool you will have for a lifetime, so it only makes sense to get the most use and value out of it. The Hitachi 799962 Drill Bit and Driver Set has a whopping 120 pieces, including masonry, wood, and metal drilling bits, and a wide range of driving bits for nearly any application. The Hitachi bits and drivers are treated with proprietary DuraCore technology, that strengthens the molecular structure of the bits for superior strength and durability. You need a drill and driver bit set to unlock the potential of the Hitachi DS18DGL, and sticking with the high-quality Hitachi brand makes the most sense. For those who noticed the head-to-head comparison video, the Hitachi DS18DGL Cordless Compact Drill Driver came up just a bit short of the DeWalt DCD771C2 20V Compact Drill Driver Kit. Both drills are compact and lightweight, both come with two batteries, and both have LED work lights. The DeWalt has just a little more power at 20 volts, a little more speed at 1500 RPM, and both products are in the same price range. However, at just 3 years, the DeWalt can't compete with the Hitachi lifetime warranty. So the choice may come down to how many years of use you expect to get out of your investment in a drill/driver; if you need a little more speed and power, and are willing to replace the tool in a few years, the DeWalt may be the better option. If you need a drill for light-duty jobs around the house, and plan to use it for years to come, the Hitachi is probably be the better investment. The Hitachi DS18DGL Cordless Compact Drill Driver is a fantastic tool, built to high standards. It has all the features you need in a compact drill and driver, including torque and speed control, with a light weight, ergonomic handle that reduces fatigue and lets you work in comfort. It's a fantastic tool for small spaces, people with small hands or less arm strength, or prolonged use where a heavier drill would get tiring over time. The included backup battery and high speed charging maximizes your working time and productivity, without interrupting the pace of your work. And the lifetime guarantee for the tool, 2-year warranty on the battery, and 1-year warranty on the charger make it a great investment. With the addition of a high-quality drill and driver bit set, this compact drill will last for years of household repairs, improvements, and projects. It's a great choice for homeowners, hobbyists, and those who need a fast, lightweight, simple drill and driver for their DIY projects.